Win the heart of your close one by sending this Pure Indulgence Valentine Gift Collection on this Valentine's Day and mesmerize your beloved by your sweet gesture. 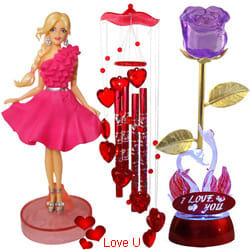 This Gift Collection is accompanied with a Barbie Figurine, Heart-Shaped Wind Chime, a Crystal Rose and LED I Love U Crystal Swan. Flowers Delivery Jamnagar, Send sweets Tiruchirapalli, Wedding Cake Salem, Diwali Mithai Vellore, Send Flowers and Gifts to Sawai Madhopur, Online Shop Bhilai, Flower to Cuddapah, New Year Flowers Gopi , Fresh Fruits Durgapur, Send Gift Thiruvanthapuram, Dry Fruits to Bhuj, Birthday Delivery Baramati, Sending to Bilaspur, Flower shop Calicut, Hoshiarpur Online Cake Delivery.